Autumnal change has shifted my activity patterns. Early October brought unusual rains and frigid temperatures to Cave Creek Canyon and I resigned myself that this year’s nightly road cruising was over. Nocturnal snakes became diurnal as the Arizona Sycamore leaves yellowed and the fading sun quickly brought chill. I began to spend my days hiking mountain trails not to look for reptiles and arachnids but rather reaching destination goals and exercising while taking in the fall colors in the Chiricahuas. But I also wanted to search for the autumn-breeding tarantulas of the region. Brent Hendrixson was on yet another extended field research excursion as part of his sabbatical, and had been transversing the southwest in pursuit of tarantulas. With earlier trips focused on scorpions, he was now visiting localities of many of our American Aphonopelma tarantulas and photographing not only our theraphosid spider diversity, but also the breathtaking vistas throughout their range. I followed his progress knowing that he would make his way to my camp, and we would seek the elusive Chiricahua Mountain tarantula, and maybe sneak in some landscape photography. Readers may recall that in late June I stumbled upon a tarantula burrow up canyon above the Southwestern Research Station and was fortunate enough to extract a very elusive spider (see blog entry #94 “An Endemic Tarantula”). This Aphonopelma chiricahua was a surprising reward on a very hot and dry June 21. You also might remember my #96, which told tales from Brent’s August visit with his summer Millsaps College course students and our trip to find another tarantula native to a Sky Island range, Aphonopelma peloncillo in the foothills of the Peloncillo Mountains. I would write up both experiences in an article for the British Tarantula Society entitled “American Mountain Endemics” (JACOBI, M. 2018. American Mountain Endemics. Journal of the British Tarantula Society 33(2): 10-16). You may download the article by clicking here. Hopefully many of you have watched my video on Aphonopelma marxi, the namesake of the Sky Island diversity or Marxi group of U.S. tarantulas. If not, click here. This group of spiders is of particular interest to me as my passion is for the fauna and flora of our Madrean Sky Island ranges, many of which are part of the Coronado National Forest. However, the closest population of A. marxi to Cave Creek Canyon is in the Gila National Forest, north of Silver City, New Mexico. This is about a two hour drive northeast of my camp at the corral. There lies the Pinos Altos Range of the Mogollon Mountains near the Continental Divide. 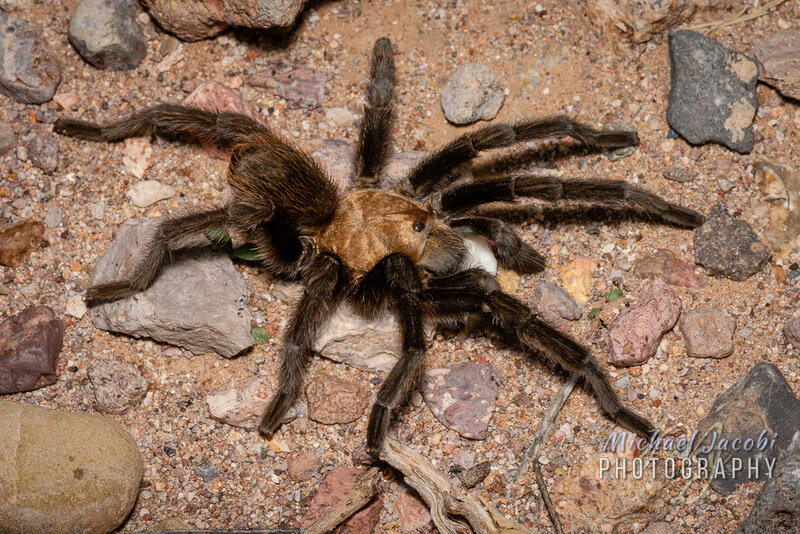 During the drive up to the A. marxi site I had encountered a wandering mature male Aphonopelma hentzi just outside of Lordsburg, New Mexico. This is the United States’ most abundant and widespread tarantula and a native of the Great Plains and Chihuahuan Desert. During a very recent run to Lordsburg for supplies I encountered three male A. hentzi, and the first one was very unusual. It was in great condition, which on October 21 is certainly not what you’d expect from a summer breeder that has wandered for months. Perhaps even more surprising was this spider’s location. I had never found one so far west. The two I would find on my return from Lordsburg were in the Animas Valley, east of the Peloncillo Mountains. This is where I would have expected to be the species’ westernmost limit in this area. But this guy was about one half mile from the Arizona border, west of Highway 80, between Portal, AZ and Rodeo, NM in the San Simon Valley. The other “desert” species of this area, including A. vorhiesi, A. gabeli and A. chalcodes, are also late spring through summer breeders, and those males have disappeared. Finding a “Texas Brown” tarantula so late in the year and so close to Arizona was very unexpected. In fact, the only Arizona records that Brent and his colleagues noted in their 2016 Aphonopelma revision were two females that Brent had found in Greenlee County, Arizona three miles west of the New Mexico border, about sixty miles north of my state line New Mexico male. The mature males that interested me though, as the leaves of cottonwoods, sycamores and maples changed with the season, were a dwarf species from the desert grassland and a mountain endemic named for the Chiricahua Mountains. Aphonopelma parvum is a diminutive newly described species from southeastern Arizona and southwestern New Mexico that is typically active in November and December. From my home in Cave Creek Canyon the population of interest would be one along State Line Road between Portal and Rodeo. And, of course, Aphonopelma chiricahua was what I would expect to be active at a similar time in the mountains, and what would be my primary target. As Brent spent October traveling from locality to locality - and species to species - west of me, I texted him images of males I found here. The first of interest was found on October 9 just after midday crossing the road 1.6 miles from my camp, just west of Portal. Air temperature was 62ºF and the elevation 4790 ft. I considered it Aphonopelma parvum due to its small size. After all, the specific epithet of that species means “very little”. However, it was somewhat in an odd area between where I have now found A. parvum and A. chiricahua. As it was missing a leg and was thereby less ‘photogenic’, I took the above image for size reference and released him rather than saving him for Brent’s eventual arrival back in the Chiricahuas. On the morning of October 11 I found an even smaller male near the mouth of Cave Creek Canyon, at 4912 ft elevation, just one third of a mile down canyon from my camp. Freshly matured, this beautiful little boy was very black and had long fiery orange-red hairs on his abdomen. I didn’t record the air temperature just before 8:00 a.m. when I encountered him crossing the road, but reviewing weather data collected at the Southwestern Research Station shows that it was in the low 50s there five hundred feet higher so I expect it was in the high 50s at the entrance to the northeastern Chiricahuas. This male was collected for Brent Hendrixson’s research. The next tarantula of note was discovered in the outdoor restroom building behind the Cave Creek Canyon Visitor Information Center (VIC). As I unlocked the men’s toilet on the morning of October 17, I found a small deceased tarantula that appeared to be an immature female. It also was collected for Brent. It was following yet another period of autumn rainfall here in the canyon and the temperature was quite chilly that morning. On Monday morning (October 29) I drove up the mountain to hike the high elevation Crest Trail near 9000 ft. Brent had spent a few days in Phoenix and while I climbed the trail out of Rustler Park he began his five-hour drive toward Portal. The Chiricahuas had experienced several days of beautiful mild weather, with temperatures in the canyon below reaching 80ºF after fifty degree mornings, and it was reasonably warm and very sunny up among the peaks. Along my hike I saw at least fifty baby Slevin’s Bunch Grass Lizards (Sceloporus slevini) sunning themselves, a pair of Mountain Spiny Lizards (Sceloporus jarrovii) and, sadly, on the drive back down a dead-on-road (DOR) Twin-spotted Rattlesnake (Crotalus pricei). Also spotted were several Red-tailed Hawks, numerous Western Bluebirds and Yellow-eyed Juncos and many other montane birds. I was back in the canyon by about 1pm and not too long after Brent pulled into the corral, already 8000 miles into this research road trip. On his drive south from the interstate (I-10) he had found a male Aphonopelma parvum near Granite Gap where Highway 80 passes through the Peloncillo Mountains into the San Simon Valley. After he settled in and we got caught up we decided our first adventure would be to drive out to State Line Road to a site where he had previously found A. parvum. This tiny species lives in burrows the size of a pea and they typically have excavated soil scattered to the side of the entrance. In the video below you will see one of the females we extracted. Believe it or not, this was actually what Brent considered a “HUGE” female. We were able to find several of these tiny females in a short span, but were somewhat surprised that we didn’t find any males moving about or hiding in clumps of grass. We did, however, find a Desert Box Turtle as we were leaving. We then decided to drive back north toward Granite Gap to perhaps find a male where Brent had found one earlier. Only a handful of miles north, when we were near Rusty’s RV Ranch where I lived four months last year and the first month of this season, we found a male. The images following the video clip show the female and male of this little tarantula. Tuesday October 30 Brent and I explored Rucker Canyon at the south end of the Chiricahua Mountains. I had never visited the area and was looking forward to seeing the “flatter” southern Chiris. After a pit stop farther south in Douglas, Arizona, we drove back up to Tex Canyon Road and west into Rucker Canyon. Brent wanted to search for a “small black tarantula” that a friend of his had reported finding in numbers while flipping rocks looking for reptiles. We flipped a lot of rocks over a couple of hours, but never saw a tarantula. However, we did find quite a number of black and red Phidippus jumping spiders (probably P. carneus), scorpions (Paravaejovis spinigerus) and centipedes. While I was sitting at a picnic table at Camp Rucker (Walnut Grove Campground) photographing two jumpers, Brent went to flip more rocks and returned with an absolutely huge jumping spider feeding on a grasshopper. The spider’s abdomen was already huge, but its gluttony apparently had no bounds. Brent was able to carry it to me on the stick where it was perched devouring the insect. We left Rucker Canyon and found our way west and then north up the west side of the Chiricahuas and headed toward Chiricahua National Monument (CNM). Several days earlier CNM’s Facebook page had a video of their Visitor Center staff releasing a male tarantula that would be Aphonopelma chiricahua. We figured that a drive through the CNM would be worthwhile and then we would drive up Pinery Canyon to Onion Saddle and back down the other side (“my side”) of the range back into Cave Creek Canyon. Not long after we passed the entrance gate we saw a male on the road, which was fortuitous as he was the only spider we would see there. We continued to drive through CNM to Massai Point where I took some photographs and then, satisfied with finding a male of our target species, we began the climb up the northwest side of the Chiricahuas. As we ascended the rugged mountain road we came upon a rafter of about a dozen Gould’s Wild Turkey. I have seen many of them over the past few days, from canyon to peaks, on both sides of the mountains. Back at camp we went out to Vista Point for some twilight landscape photography. Yesterday was Halloween and the last day of Brent’s visit. I had anticipated that we would search for A. chiricahua burrows, probably near where I had found that female in a burrow back on June 21. However, it is an extremely elusive species and Brent was discouraged by the dozen or so attempts he had made to find this species over the past decade. After being on the road staying in tent or hotel for a long stretch, he was also looking forward to getting home to Jackson, Mississippi. He decided not to spend the night and asked me what hike I would recommend. He wanted to hit the road by mid-afternoon and take a break from spider hunting by exploring one of the trails that I frequent. I suggested that we drive up to the top of the mountain back to Onion Saddle and then hike the Barfoot Lookout Trail. Brent had been up to the top before and we drove up and over Onion Saddle the previous day, but he had never seen Barfoot or Rustler Park. After four or five days of very mild “Indian Summer” weather, it was colder Halloween morning and when we got up over 7000 ft it was cloudy and I worried that the amazing views we would have from the montane trails would be obscured by the fog. However, after driving into Rustler Park and showing him the area where our hiking club had encountered a tarantula at over 8500 ft. ten days earlier, and then driving to Barfoot Park and giving him a tour there, the cloud cover was parting a bit. Although it was a crisp 40ºF there at 8400 ft. and we were both wearing shorts, we at least had vests or flannel shirts and decided to stick to hiking the Lookout Trail. After our hike we drove down the mountain and before we descended to Onion Saddle Brent shouted for me to stop. Even though it was pretty cold I had been scanning the road for snakes, as I had seen that dead-on-road Twin-spotted Rattlesnake two days earlier. But before he jumped out of my truck Brent said, “I think I saw a tarantula”. Sure enough, there in the road was an adult male Aphonopelma chiricahua. It was not even half the size of the one we found in CNM the day before! It is not uncommon for high elevation populations of animals to be considerably smaller, and we discussed the miniaturization of species with altitude. I suggested we pull off the road and walk around a bit and see if we found any other spiders. Brent began flipping roadside rocks and I walked back up the road looking in the ground litter on each side of the road for burrows. After a short period of time I called out to Brent that I had found another male! This one was curled up on top of a grass tussock and was in even better condition than the male Brent fortunately saw on the road. He also was very small - perhaps an inch and a half in diagonal legspan. As I showed Brent where I found him I began to closely examine a variety of wispy grass that covered much of the road shoulder. Before long I had found two small holes that weren’t much larger in diameter than the Aphonopelma parvum holes we had extracted females from two days earlier. They weren’t covered with silk and I wasn’t initially certain they would be tarantula burrows, but they were perfectly round and very clean and I soon became hopeful. Both holes were partially obscured in the middle of a patch of this fine grass. Brent began to flood the burrow and we were greeted by the forelegs of a tarantula! He poured a little more water and as it rose again and protruded from the burrow mouth a bit more, Brent used his other hand to scoop beneath the spider with a small trowel and our gorgeous prize, a surprisingly small adult female A. chiricahua, was out in the open. Below she is in all her glory, photographed later on my camp’s picnic table. After the image is another short video clip of Brent handling the spider in the field. Brent now had three males (two little guys from our high elevation ‘hotspot’ and the much larger male from CNM), one mature ‘high altitude’ female and a bonus immature. But we weren’t done. After returning down to my camp (after passing a troop of eight White-nosed Coati), I needed to drop something off at the post office so we drove into Portal and very close to where I had found the little male back on October 11 we found yet another male! Today November begins and after training a new VIC host the next two days I will only have a few Saturdays remain as a VIC host. I’ll be staying until the end of the month, but have plenty of free time and also time to do some other non-hosting projects at the VIC. My tentative plan is to put winterize the Wheelhouse on November 30 and move it to storage at Rusty’s RV Ranch. Brent intends to fly back to Arizona for the first week of December to look for a couple of other late fall-winter active Aphonopelma (A. paloma, A. superstitionense) and we discussed me joining him. Then I will return to Chicagoland for a few weeks prior to my January Malaysia trip. And then perhaps back to Cave Creek Canyon in March?